NERSCs Edsion was used to investigate the quantum semiconducting properties of Indium Nitride (InN) nano structures in hexagonal and triangular crystalline configurations. CRD Visualization experts worked with the science team to produce compelling and informative visuals, which have appeared on journal covers, and featured on the NERSC website. 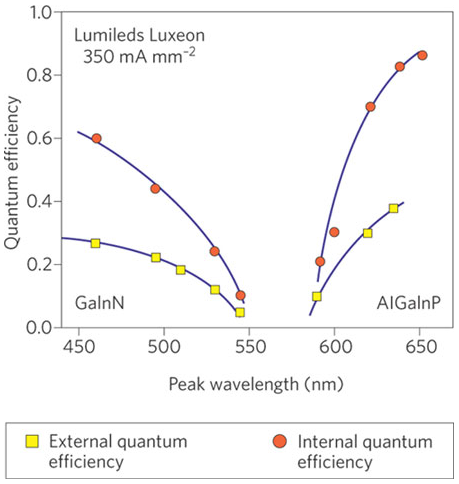 Figure 2:The “green gap”: The efficiency of LED’s plummets in the longer visible wavelengths. The study found that imposing quantum confinement on InN results in efficient optical emission in the visible range, including the green wavelengths where the efficiency of commercial light emitters is low. As a result InN nanostructures provide a route to III-nitride band-gap engineering at visible wavelengths that avoids the difficulties of composition fluctuation and phase segregation encountered in III-nitride alloys. Light emission and absorption are expected to be highly efficient because quantum confinement enforces strong exciton localization and leads to large exciton binding energies in excess of 1 eV. Large binding energies reduce thermal exciton dissociation, making InN nanostructures attractive for lasers and LEDs capable of operating with high efficiency at room temperature in the visible range. The visualizations were made using a combination of tools. A custom Qt and VTK based application was made for reading the simulation data. 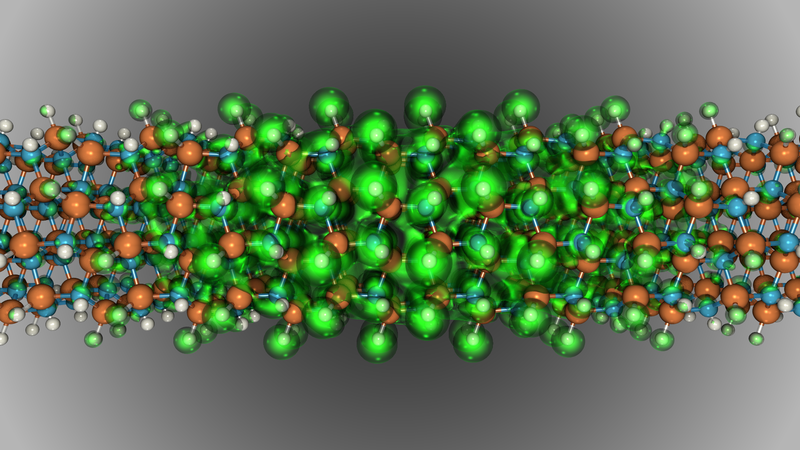 This application converted the molecular data into POVRay primatives and the mesh based data into native VTK format. ParaView was then used to compute isosurfaces and export them into POVRay format. POVRay was then used to produce the final renderings. This work could lead to high efficiency natural looking LED lighting. Dylan Bayerl and Emmanouil Kioupakis. Visible-wavelength polarized-light emission with small-diameter inn nanowires. Nano Letters, 14(7):3709–3714, 2014. PMID: 24527880.